THE Rudd Government will launch a twin assault on smoking today by announcing steep increases in tobacco excise and laws requiring cigarettes and other tobacco products to be sold in plain packaging from 2012. The excise increase, which will help fund the government’s health reforms, will be short of that required to lift the price of a packet of cigarettes to A$20, as recommended by the government’s Preventative Health Taskforce. There was speculation last night that the excise increase would add at least $2-$3 to a pack of 25. How the generic pack of cigarettes will look. In what the Rudd government is hailing as a world first, it will also announce legislation to mandate standard packaging for all tobacco products, a move likely to incense the $9-billion tobacco industry. 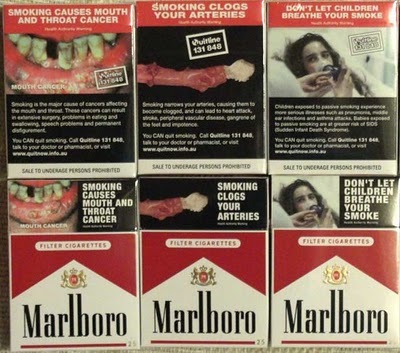 From January 1, 2012, all brands of cigarettes will be sold in plain boxes. The boxes will be the same colour and carry large, graphic health warnings. The brand of the cigarette will appear in a small font. The font style and size, as well as the position of the brand will be uniform. The laws will ban the use of any colours, logos, brand imagery or promotional text that would in any way distinguish one brand of cigarettes from the other. The government is trying to shift the policy emphasis to health after its decision to shelve its emissions trading scheme until at least 2013 has been roundly condemned by all sides. The changes to tobacco packaging are based on research which found packaging is a subtle form of advertising that significantly influences smoking rates and habits. The government will test various packages before settling on a final design. Labor is anticipating a nasty fight with the industry. The party does not accept donations from the tobacco industry, whereas the Liberal Party does. Smoking kills 15,000 Australians a year despite the proportion of the population aged over 14 which still smokes having dropped from 30.5 per cent in 1988 to 16.6 per cent in 2007. The government wants to reduce the rate of smokers to 10 per cent by 2018. Posted in: Costs, Legislation, Tobacco Tax.